The story of the how a Catholic archdiocese took root on the bluffs along the upper Mississippi River is chock full of stories — stories about the people who planted those roots and those that nurtured them, stories that will enlightne you, force a chuckle out of you, perhaps even shock you. 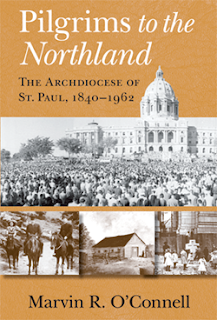 Marvin O’Connell tells as many as he could fit into 615 pages of this early history of the Archdiocese of St. Paul and Minneapolis. There is a minimum of the kind of statistical growth numerology that populates too many accounts of church history. Instead, Father O’Connell puts the history of the Catholic Church in the United States — and of U.S. Catholics — into its national and international perspectives, always with human touches. So valuable are the introductory pages to each chapter that explain what was going on in the nation — or in the world — at a particular juncture in time between 1840 and 1962, where O’Connell ends this work. As much as he can the priest of the archdiocese and University of Notre Dame professor emeritus helps readers understand what shaped the church that straddles the Mississippi today, and especially what — and who — was responsible for making that happen. Of course bishops and archbishops play major roles, with the iconic John Ireland taking over the stage by force of length of service from the community’s earliest days through the early 20th century, and by force of personality. It was Archbishop Ireland’s presence on the national stage as the spearhead of Americanization — that movement that promoted the concept that this new land of freedom was the best place for the Catholic faith to flourish, and that freedom and faith were the best of partners. Not everyone agreed, including some in high places in the church both in the United States and at the Vatican. Ireland was of the mind that immigrants had to untie the apron strings to the old country and become American in order to be respected and take their rightful place in order that their faith influence American culture. The challenges that had to be overcome by the area’s episcopal leaders fills pages, to be sure, but O’Connell spends just as much if not more time on some of his priest heroes, people from the St. Paul-Minneapolis archdiocese who have influenced both the world and the church. He lovingly gives credit, too, to the women religious — the Sisters of St. Joseph of Carondelet in particular — for their selfless service to the People of God not just in the Twin Cities but across Minnesota and the Dakotas, as the Diocese of St. Paul was originally defined. Generous oil man Ignatius A. O’Shaughnessy is granted his due in this history, too. But two priests capture many pages, and deservedly so, because they influenced so many others, both clergy and lay. There is the passionate teacher and advocate for social justice, Monsignor John A. Ryan, who grew up on a farm in rural Vermillion Township and became an adviser to Franklin Delano Roosevelt. Labeled “The Right Reverend New Dealer,” Ryan was the architect and advocate of social justice principles that are now woven into the texture of American life: the minimum wage, a progressive income tax, the eight-hour work day, unemployment insurance, etc. The early adopters of the Liturgical Movement, Benedictine Dom Virgil Michel, the St. Paul Seminary’s Father William Busch get well deserved notice, but historical ink tells us more about Father John Bussard, a founder of the Leaflet Missal and Catholic Digest, which in 1936 enjoyed a circulation of a million copies a month. Bussard — in 1938 mind you — convinced Archbishop John Gregory Murray — to have the altar in the lower crypt of the new Nativity of Our Lord Church in St. Paul to be free standing, so that at Mass the priest faced the congregation and the worshipers could see and follow his actions at the altar and pray with him from their vernacular missals. O’Connell faithfully reports the successes and the failures of archbishops Grace, Dowling, Murray, Brady and Byrne, but it is Paul Bussard and John A. Ryan who he calls “the two most influential Minnesota Catholics” during the middle third of the 20th century. Archbishop Murray’s opposition to the Nazis is part of the history, including his invitation to his priests to volunteer to be chaplains during World War II. The archbishop promised that any curate (associate pastor) who volunteered to be a chaplain would be named a pastor after the “inevitable triumph” (Murray’s words). He kept his word. It was the aftermath of World War II that changed Catholic status in the United States, O’Connell opines. Unfortunately a review can touch only a fraction of the topics and tales Father O’Connell shares, and that’s how it should be. Buy the book. At $70, this University of Notre Dame Press tome is pricey, but it’s great reading. O’Connell has a marvelous literary style with clever segues and a timely sense of humor. For example, at the installation Mass for Coadjutor Archbishop Murray, there were 5,000 worshipers (“nine of whom fainted during the lengthy ceremony”), O’Connell inserts. Some of the history is admittedly not what a public relations person might put forward, but then O’Connell’s task was history, not PR, and the author doesn’t shy from the seamy side of Catholic history. There were some disreputable characters in this neck of the woods over the course of the years. The very best anecdotes are from priests he interviewed who shared the stories of their own encounters in the seminary, parish or chancery office that add in sight and color as to what Catholic life was really like.